The cathedral bra is a style that is often associated with the 1950s, but was in fact first created in the 1930s (as was the case with the spiral stitch ‘bullet’ bra). 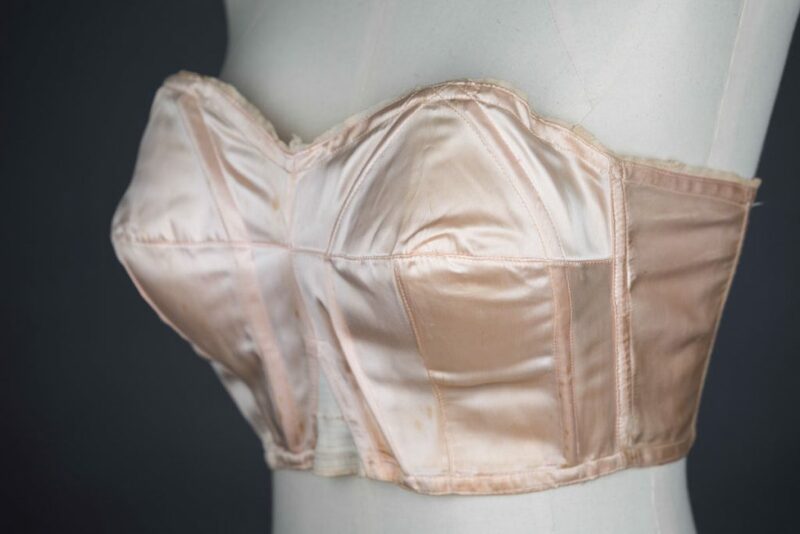 The name ‘cathedral’ refers to the manner in which boning is placed on the bra, as it is supposedly reminiscent of arches within the aforementioned architectural structures. 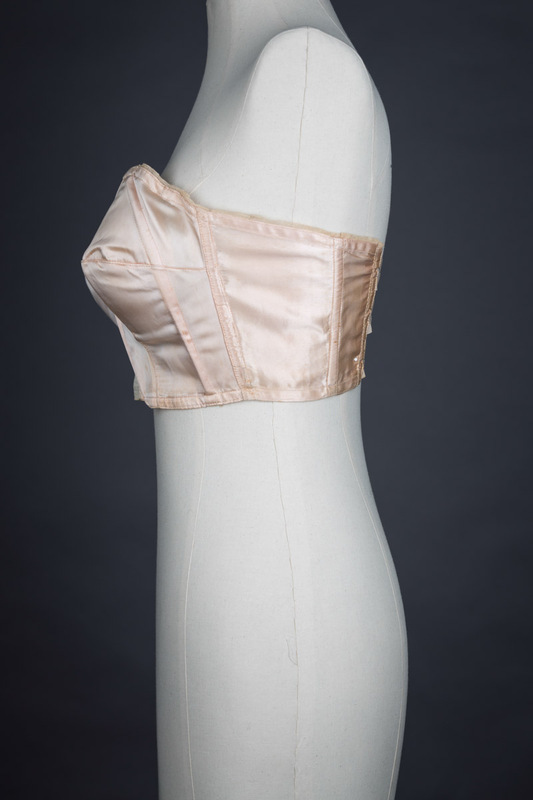 The structure of the bra is designed to lift and point the bust shape. 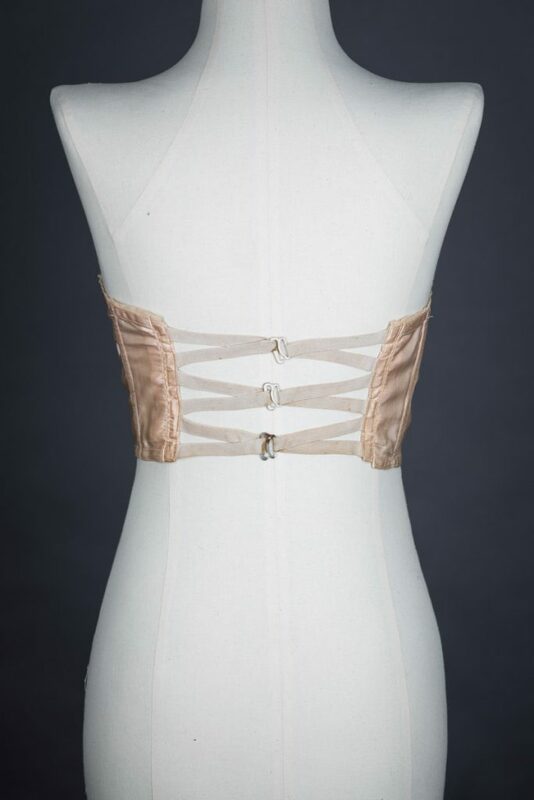 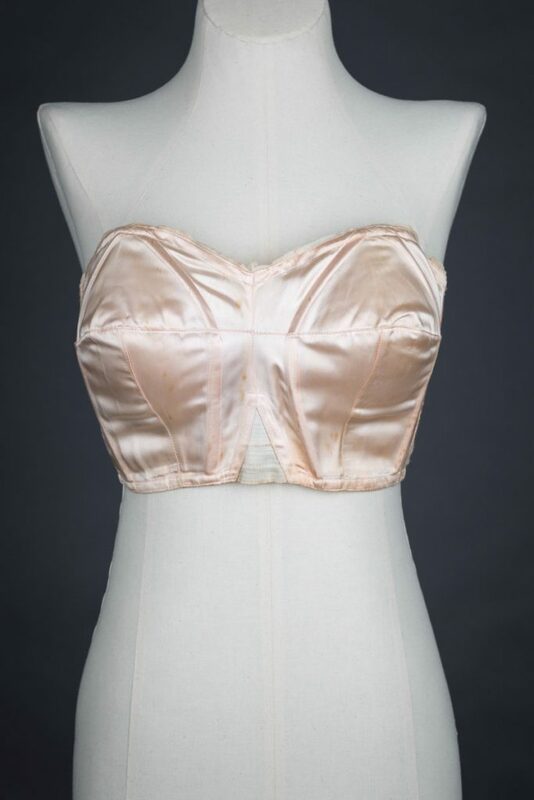 The 1930s were a time period were brassieres were beginning to grow in popularity as they helped women to achieve the fashionable silhouettes of the era. 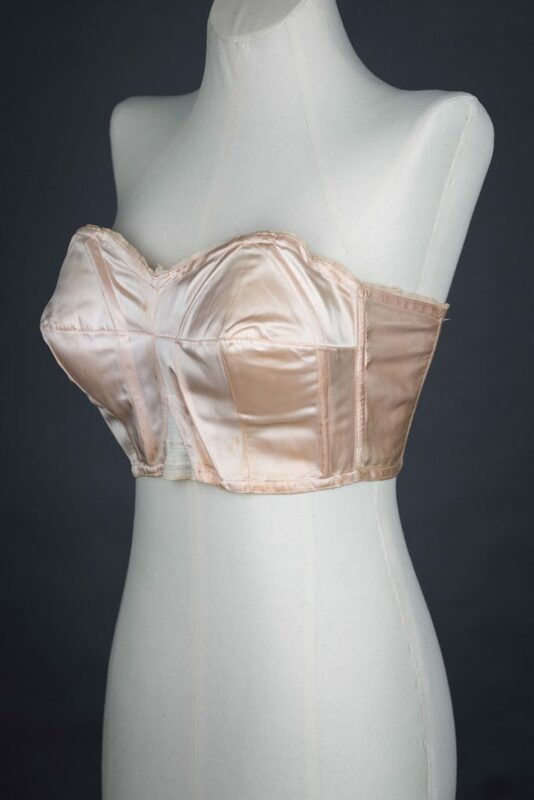 This bra is constructed with a main fabric of rigid and sturdy rayon satin with an elastic gore insert at the centre front. 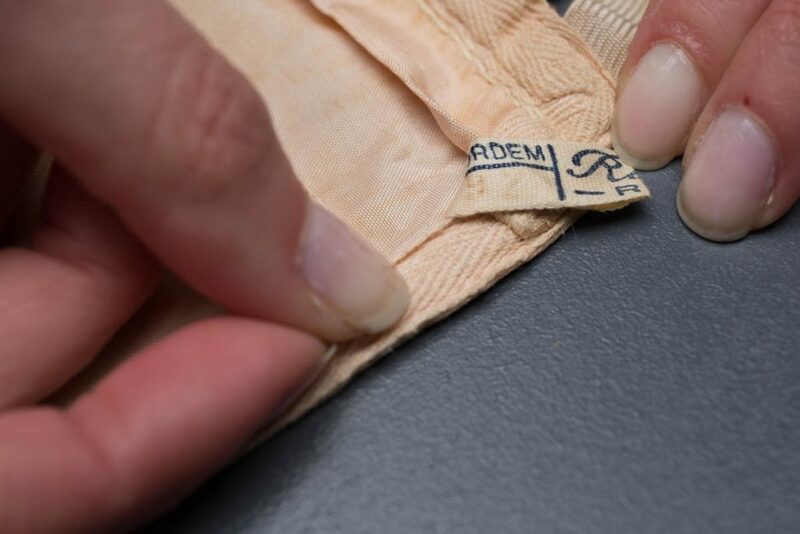 It is entirely machine stitched, with a combination of twin needle lockstitch along the top and bottom edges and along the bone casings, with other seams sewn with a delicate narrow overlock stitch. 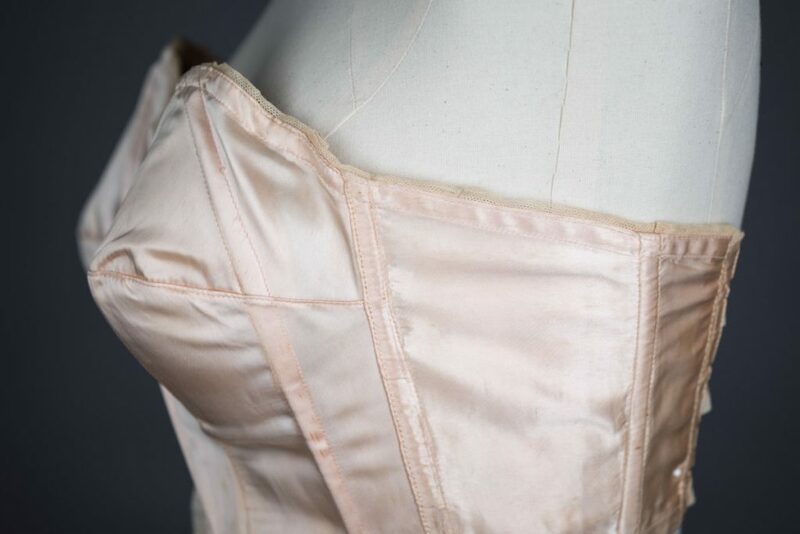 The top edge of the bra has a narrow trim of folded cotton bobbinet tulle, with the top and bottom hems folded in and taped over with cotton twill tape. 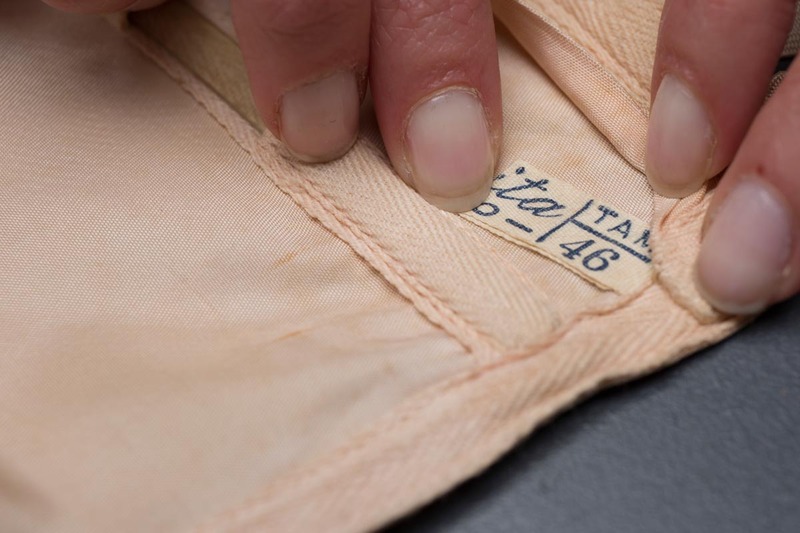 The bone channels also use this tape to encase bones. 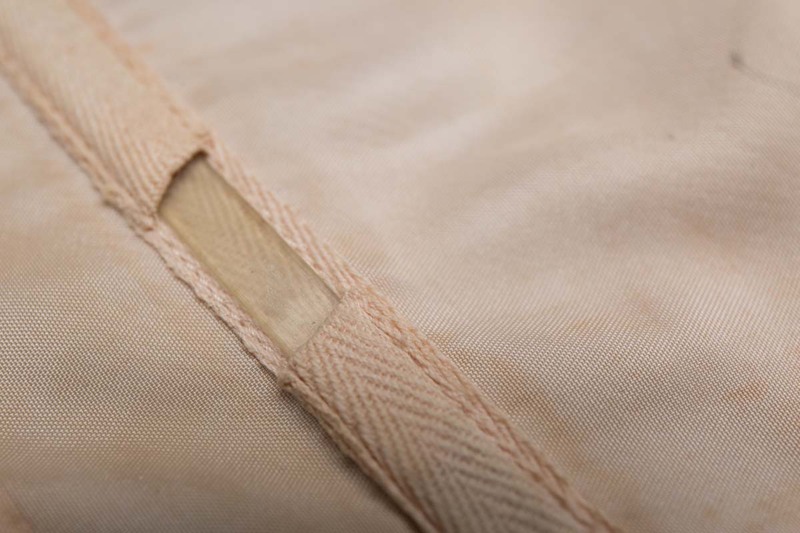 It is worth noting that the bone channels in this garment are interrupted, leaving the interior celluloid boning partially visible. 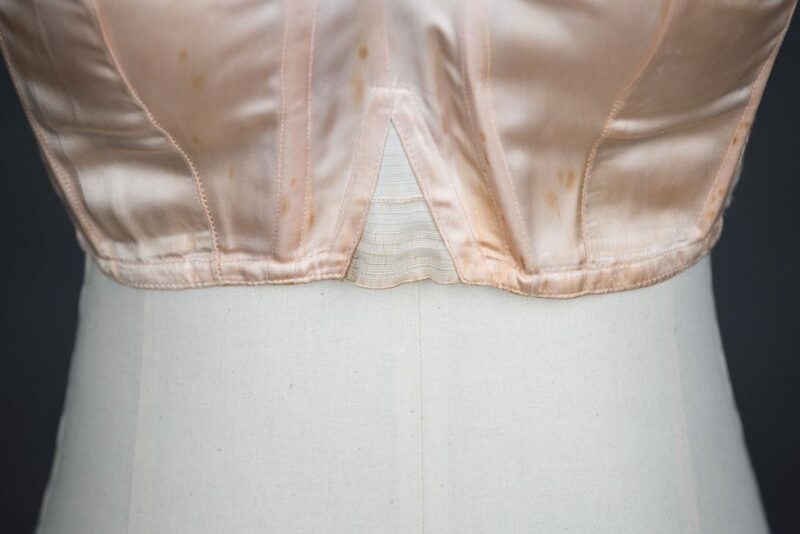 It is possible that this is either intended to display the unusual technology used in structuring this garment, or to allow the bones to be removed when washing the garment. Celluloid is an early plastic, and saw a certain amount of popularity in the 1930s, used in components such as bra strap adjusters. 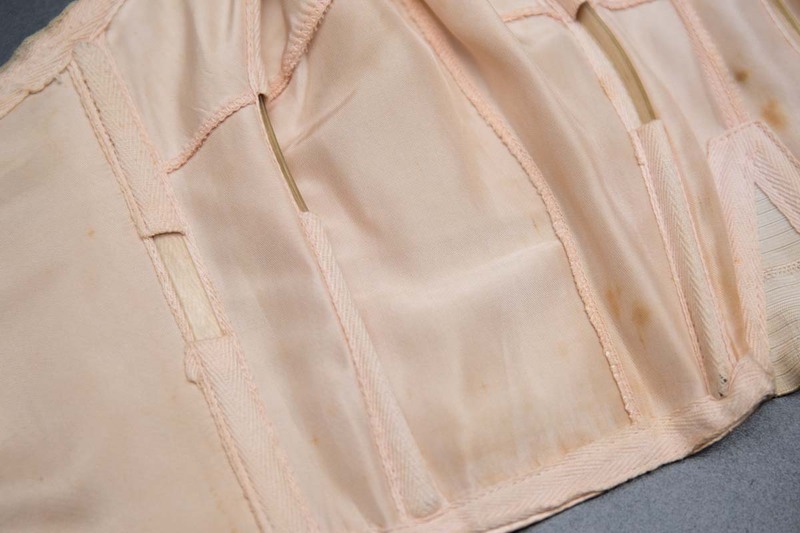 The use of celluloid was soon replaced with other plastics such as bakelite, arguably due to the fact that celluloid is relatively unstable and flammable. 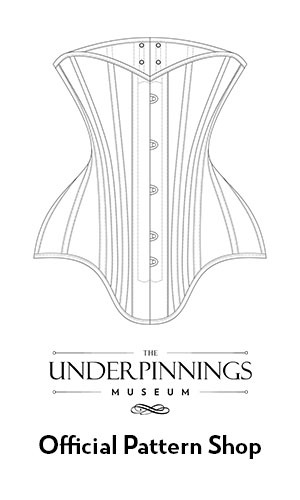 The bra fastens at the centre back with three rows of elastic loops on each side, with enamelled metal hooks. 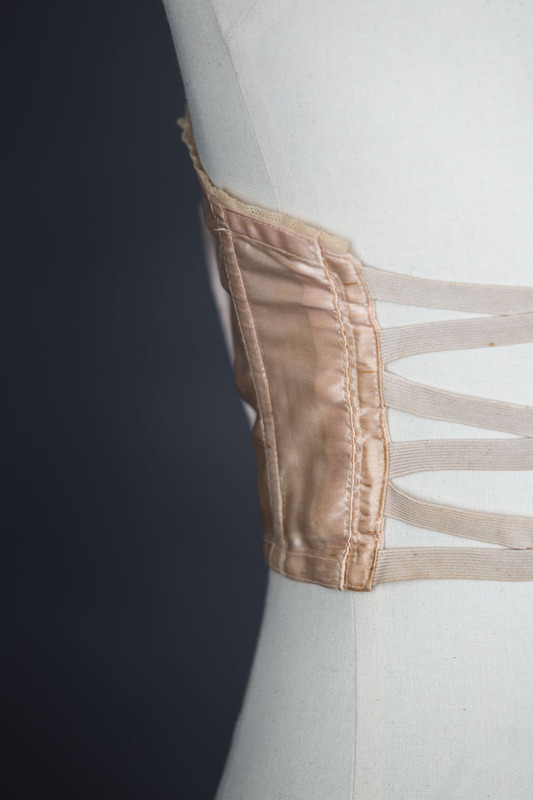 This use of elastic provided a certain level of fit flexibility, when many of the garments of this period had a very rigid and unflexible fit. 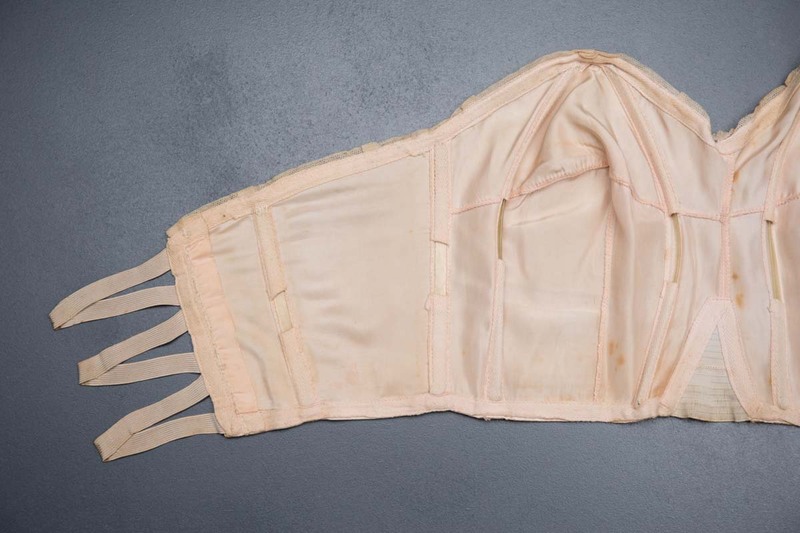 This bra was altered by its original owner at some point, with the satin centre back of the bra being folded in and hand stitched over.